The simplicity of riding a cruiser is the easiest sell. The ability to grab a board and simply cruise with mates is so simple. No rules, no expectations… just cruise and have fun. Of all the categories it has the least number of barriers and delivers so much stoke with friends. For us it’s about community and sharing the stoke and therefore the ability to increase unit sales in store to families and groups is perfect. With so many shapes, sizes and graphics (especially with Penny) it’s so easy to build out a quiver for any occasion. Our classic range will always reign supreme as it allows the customer to truly reflect their personality. However, we are pumped about the recent release of Star Wars collection in both the 22” and 27” categories. Featuring characters such as Darth Vader, R2-D2, Boba Fett and the Strom Troopers this range has had some fantastic results. In the coming months you’ll see more artist series boards including the renowned surf artist, Andy Davis. His iconic art is so prominent in surf culture and is all about good times, so it’s a perfect fit for Penny Skateboards. We have always had a great mix of male and female riders, so we aren’t seeing an increase as its always been strong for us. There are however a lot more females getting into the skateboarding which we are stoked to see. It’s a great opportunity for retailers to capitalise on. Our campaigns have always included both genders as we see male and females both finding the stoke with our product. So, it’s nothing new for us, we’re just stoked for everyone that is getting on a skateboard. We have two POS stands in stock which are available to select retailers and we add to our point of sale list of items all the time. We believe that it’s critical to have solid and on-brand in-store representation, so we routinely refresh our POS. We also work closely with all of our key accounts so that we are able to support them with individual or tailored POS where needed. This also extends to our online brand representation. We send seasonal asset packages to our customers which they can then use on their websites, social media channels, customer communication etc. Plus of course we heavily promote the brand on our own social channels and through geo targeting on the brand channels. We also run training sessions for customers where they are invited to the Shiner HQ for a brand immersion session and these have been really well received to date. In summary, we try to cover all bases and ensure our customers are as supported as possible with everything they need to effectively drive sales. I think this is totally brand dependant. For us our shapes are synonymous with our brand. Our classic shape of the 22” and 27” will always remain strong for us but as stated earlier, we have developed a wider and more aggressive 32” board allowing for the rider to perform more technical skating. Our board construction and materials have always been what we are proud of. Because our pride in quality we have recently been promoting our lifetime warranty… not many brands can do this. Penny is colour… that’s what we do best. 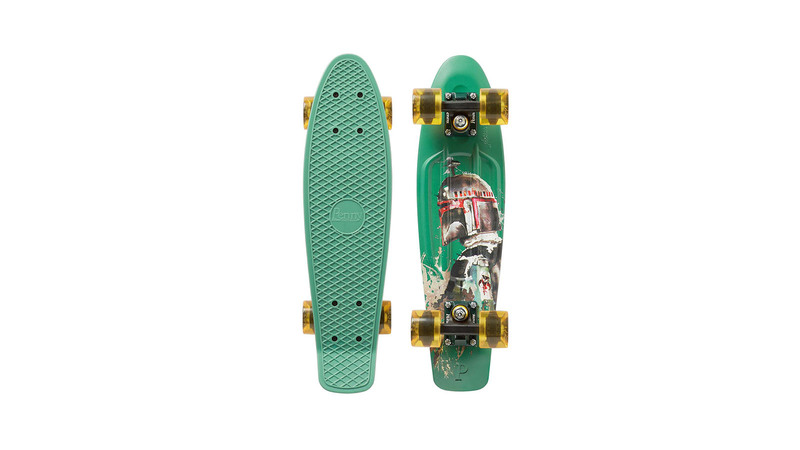 I can’t think of too many colours we haven’t released a Penny Skateboard in. Our next season will continue this with our 90’s throwback collection in the Classic range that is packed full of colour to celebrate an era that was the golden age of sportswear. Our graphics are always impactful, and you’ll see a huge range of classic surf style designs, to tropical print and the timeless camo print with a new Shark Bomber riff. For Penny it’s about providing the best quality components that match what we do with our decks. Our trucks and wheels focus on providing the smoothest ride whether you’re bombing a hill, cruising the streets or just rolling with friends. All of our trucks and wheels come in so many colours, just like our decks, including block colour, transparent materials and graphic print designs. They’re the perfect add on sale for customers that want to personalise their completes.